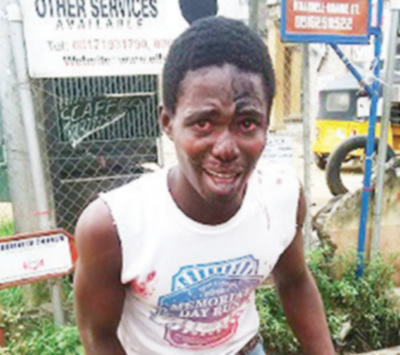 THERE was drama at the Ada-George axis of Port Harcourt on Sunday morning when a victim of phone snatchers knelt down and begged an operative of the Special Anti-Robbery Squad not to kill her assailants. The victim, who identified herself as Onyeka, was waylaid by two phone snatchers on her way to church. The victim, who spoke with Southern City News, said one of the two men pulled her hand snatched her IPad. Onyeka said she had to call her brother, who immediately mobilised his friends from a neighbouring street and chased after the suspects. “While one of them was caught and taken to a nearby Rumuolumeni Police Station, the other suspect holding the phone was given the beating of his life. “As this was going on, a group of men from SARS came to the scene and one of them cocked his gun to shoot the man who snatched my phone from me. I immediately began to beg them not to shoot him. “I was afraid that the (suspect) blood may be on my head. Fortunately, the SARS people agreed. They did not arrest him maybe because they thought the guy (suspect) might not survive the beating by the mob,” Onyeka narrated. The suspect, who identified himself as Chikanma, told Southern City News it was hunger that pushed him into phone snatching. Efforts made by our correspondent to get the state Police Public Relations Officer, Mr. Nnamdi Omoni, to speak on the matter proved unsuccessful as calls to his phone indicated it was switched off as of the time of filing this report.